PhAB makes it easy to create the user interface for an application. Once PhAB has generated code stubs for your application, you'll need to write the parts that make the application do something. This chapter describes how to work with the code for a PhAB application. For information about using threads in a Photon program, see the Parallel Operations chapter. PhAB creates global variables and manifests for every module you create, and every widget with a unique instance name. This makes it easier to access the widgets from your application code. ABN_widget_name—where widget_name is the widget name or module-instance name that you defined in the Resources or Callbacks control panel. The value of this variable is unique in the entire application. ABW_widget_name—where widget_name is the widget name or module-instance name that you defined in the Resources or Callbacks control panel. PhAB doesn't create ABW_... manifests for menu modules or menu items. Menus typically don't exist for very long, so manifests for them aren't very useful. If you need to change the resources of the PtMenu, create a setup function for the menu module and do the work there. See “Module setup functions,” below. The manifest for a window module refers to the last created instance of the module. See “Handling multiple instances of a window,” below. A widget's global variable and manifest are valid only after the widget has been created, and before it has been destroyed. Remember that the global variable and the manifest are valid only after the widget has been created and before it has been destroyed. If you have more than one instance of a window module displayed at a time, then you'll have a problem accessing the widgets in the window. The problem stems from the fact that ABW_instance_name for any widget in a window module points to the last created instance of that widget. If you have more than one instance of the window, then you have more than one instance of the widgets within the window created. If you have two instances of the window on the screen at the same time and the user clicks on the Search button, how can you get the value in the Name text widget? Since two instances of the window exist, two instances of the text widget exist. 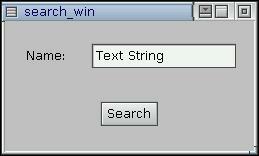 ABW_name_txt points to the last instance of the text widget that was created. Where do you get window_wgt? In the above case, you'd have a code callback on the Search button. The first parameter passed to that code callback is the widget pointer to the Search button. You can use ApGetInstance() to get a pointer to the window that contains the Search button. /* The 'name' variable now points to the correct name text. ABM_internal_link_name—where internal_link_name is a pointer to the module's internal definition. For more information about using internal links, see the Accessing PhAB Modules from Code chapter. PhAB lets you define one global header file for each application. PhAB generates this file only once, the first time you generate the application's code. Once you've defined the header, PhAB automatically includes it in any generated C or C++ stub file. So it's best to define the header when you first create the application. See “Startup Windows tab” in the Working with Applications chapter. You can modify the header whenever you need to. Including this line ensures that the global variables are defined in this code file and used as extern declarations in all other code files. In the Makefile, make the code files dependent on the header file. That way, if you make any changes to the header, all the code will be recompiled when you make your application. PhAB generates a function for every initialization function, module setup function, callback, function menu item, and so on you've specified in your application. If you don't need a function, leave its name blank. After a function has been generated, you're free to modify it. There's just one condition: if you change the function's name, you must also change the name you specified in the link callback or internal link definition. Otherwise, PhAB will continue to regenerate the old name every time it generates the application. Create a stub function and put it in filename.ext. This file will include the headers and function structure required to compile in the Photon environment. PhAB recognizes .cc, .cpp, and .C as C++ extensions. If this file already exists, the stub function is added to it. You can use this technique to reduce the number of code files for your application. You can place any number of functions in the same file. We recommend you put all functions related to a module in the same file. Generate a stub C++ static member function, but no prototype. Don't create a stub function or a prototype. Instead, invoke a C++ static class member function. Prototypes aren't generated for class member functions; your application must have the necessary declarations in its global header file. Generate a prototype for a C function, but not a stub. This is useful if you're using a library of C functions. Generate a prototype for a C++ function, but not a stub. This is useful if you're using a library of C++ functions. You can use C and C++ in the same PhAB application. See “What PhAB generates” in the Generating, Compiling, and Running Code chapter. PhAB lets you define an application-level initialization function. The PhAB API calls this function once at startup, before any windows or other widgets are created. For information on setting up this function, see “Startup Windows tab” in the Working with Applications chapter. The initialization function includes the standard argc and argv arguments so that your application can parse command-line options if needed (see below). You can also use this function to open any widget databases (see the Accessing PhAB Modules from Code chapter) or other application-specific data files. /* Handle command-line options - if required. You can suppress the options for the application's size and position—see “Command-line options” in the Working with Applications chapter. You can also define additional options. Edit the application's usage message, which you'll find in the Usemsg file in your application's src directory, to include any additional options. For details about the usage message syntax, see usemsg in the QNX Neutrino Utilities Reference . include a case branch for each option, but do nothing in it. You could also include a default that prints a message if an invalid option is given. don't include case branches for them. If you do this, you won't be able to have a default branch. The PhAB library also looks at the ApOptions array to take into account the options you've added. For example, for the above code the library recognizes that -px100 specifies the X position (along with -p), while -ax100 doesn't. A module setup function is generated if you specify a function name in a module-type link callback, as described in “Module callback” in the Editing Resources and Callbacks in PhAB chapter. an instance pointer for the PhAB module being created. You'll need to save this pointer if it points to a window module that supports multiple instances. A pointer to the widget that caused the setup function to be invoked (that is, the widget that caused the module to be displayed). For an internal link, this pointer is a copy of the widget pointer passed to ApCreateModule(); this pointer is useful for positioning the module. You can also determine the widget that caused the setup function to be invoked by calling ApWidget(). This setup function is being called before the module is realized. This setup function is being called after the module is displayed on the screen. a pointer to a common Photon callback structure. The structure provides information related to the widget callback being invoked, the Photon event, and some widget-specific callback data. The format of the data varies with the widget class and callback type. For more info, see PtCallbackInfo_t in the Widget Reference . Normally, a setup function returns the value Pt_CONTINUE. This tells the PhAB API to continue processing and to display the module being linked. For window and dialog modules, you can return Pt_END to terminate the link callback and destroy the module without displaying it. For window modules, you can return Pt_HALT to neither realize nor destroy the window. This is useful if you want to realize the window later. A code-callback function is generated if you specify a code-type link callback, as described in “Code callbacks” in the Editing Resources and Callbacks in PhAB chapter. A pointer to the widget instance that invoked the callback. This is a pointer to a PtWidget_t structure, but you should treat it as a widget identifier; don't manipulate the members of the structure. This callback function is being called by a Cancel link. This callback function is being called by a Code link. This callback function is being called by a Done link. a pointer to a common Photon callback structure. The structure provides information related to the widget callback being invoked, the Photon event, and some widget-specific callback data. The format of the data varies with the widget class and callback type. For more information, see PtCallbackInfo_t in the Widget Reference . Your callback should return Pt_CONTINUE unless the description of the callback gives you a reason to return some thing else. ABR_CANCEL and ABR_DONE callbacks can return Pt_HALT to prevent the module from being closed. The x and y coordinates of a single point. You'll use it to specify locations on the screen, in widget canvasses, and so on. A width (w) and a height (h), usually in Photon coordinates. You'll use it to specify dimensions. A rectangular area, expressed as a PhPoint_t for the area's upper left corner, and a PhDim_t that defines the area's size. A rectangle, expressed as two PhPoint_t structures, one for the upper left corner, and one for the lower right. A list of rectangles. This structure is used mostly in damage lists that define the areas of the screen or a widget that need to be refreshed. Photon maintains an internal pool of tiles because they're frequently used, and using a pool reduces the amount of time spent allocating and freeing the tiles. Use PhGetTile() to get a tile from the pool, and PhFreeTiles() to return a list of tiles to the pool. You probably won't use the PhTile_t structure unless you're using a PtRaw widget or creating a custom widget. For more information, see “PtRaw widget” in the Raw Drawing and Animation chapter, and Building Custom Widgets . PtTimer widget — easy, but not very accurate. RtTimer* functions — a bit more work, a bit more accurate. Timers in a separate process from the GUI — necessary for hard realtime. For more information, see “Threads” in the Parallel Operations chapter. Arm a timer event. Don't use this function in an application that uses widgets. Arm a timer event on a widget. This routine is typically used when building custom widgets. Some widgets (such as PtTerminal) already use this type of timer, so calling PtTimerArm() may have unexpected results. PtTimer is easy to use, but doesn't give accurate timer events. In particular, it doesn't guarantee a constant repeat rate; since the repetition is handled by rearming the timer for each event, any delays in handling the events accumulate. Kernel timers guarantee an accurate repeat rate even if your application can't keep up with them. These functions are more accurate than PtTimer because the timer is rearmed by the kernel, not by Photon. However, if Photon is busy handling events, there could still be delays in processing the expiration events. You can also use a function menu item to generate new items at runtime. The methods for doing these things are discussed in the sections that follow. If a menu item isn't currently a valid choice, it's a good idea to disable it so the user won't try to select it. Of course, you'll need to enable it when appropriate, too. If your menu has any toggle items, you'll also need to set them before the menu is displayed. To do these things, use the ApModifyItemState() function. The first argument is a pointer to the menu module. For example, if the instance name of the menu module is draw_menu, pass &draw_menu as the first parameter. The rest of the arguments form a NULL-terminated list of the menu items to be set to the given state. This list consists of the ABN_... constants of the items. a pointer to the menu module. For example, if the instance name of the menu module is draw_menu, pass &draw_menu as the first parameter. To get the current item text, call ApGetItemText(). If you change the item's text, you probably need to change the shortcut, too, by calling ApModifyItemAccel(). Sometimes you may need to generate the menu items at runtime. For example, PhAB's Window menu includes a list of the modules in your application. To generate menu items, add a function item to your menu module (as described in “Creating function items” of the Working with Modules chapter), and edit the stub function PhAB generates. The parameters passed to this function are of no use. The second parameter in the call to PtCreateWidget() is the parent of the widget; when you're generating menu items, this should be set to Pt_DEFAULT_PARENT. This makes the new item a child of the current menu or submenu. Don't call PtSetParentWidget() in this case. A pointer to the menu item selected. Arbitrary data passed to the callback. This is different from a PhAB code callback, which receives apinfo as its second argument. The last argument to PtAddCallback() specifies what's to be passed as the client_data argument of the callback. For more information, see “Callbacks” in the Managing Widgets in Application Code chapter. Create a menu button for the cascade menu, setting the Pt_ARG_BUTTON_TYPE to Pt_MENU_RIGHT or Pt_MENU_DOWN, as required. Create a new PtMenu widget and set Pt_MENU_CHILD in the new menu's Pt_ARG_MENU_FLAGS resource. PtMenu is a container, so this new menu becomes the current default parent. Create submenu items, as described above. Continue adding items to the top menu, if desired. If your application is making changes to a lot of widgets at once, you might want to delay updating the display until you're finished making the changes. Doing this can reduce flickering, and, in some cases, improve your application's performance. all of your application's widgets — the Photon libraries record any damage, but don't redraw the widgets. a specific container and its children — the libraries don't even record the damage. When the hold count is nonzero, the display isn't updated. To increment the hold count, call PtHold(). When you modify a widget, the libraries mark it as damaged. When the hold count is 0, the libraries repair damaged widgets as normal. To decrement the hold count, call PtRelease() or PtUpdate() (these two functions are identical). For more information about these functions, see the Photon Library Reference . When the container's flux count goes to zero, you must explicitly damage the areas you want to repair. When the container's flux count goes to zero, the entire container is marked as damaged. PtContainerHold() and PtContainerRelease() are easier to use, because you don't need to determine which widgets or areas you need to damage. However, there might be more flickering than if you use PtStartFlux() and PtEndFlux(). If you need to determine if a container or any of its parents is currently in flux, call PtIsFluxing(). You can call PtFlush() at any time to immediately update the damaged areas of the display. PtFlush() ignores the hold count and doesn't change it. If a container is in flux, and you modify it or its children, the Photon libraries don't mark the widgets as damaged, so PtFlush() doesn't repair them. Combining holds on the whole application, holds on containers, and calls to PtFlush() can give you unexpected results. For example, if you hold the entire application, damage part of a container, hold the container, modify it, and then call PtFlush(), the libraries repair the damage — displaying whatever portion of the modifications that affect the damaged area.